Shannon and Callahan have selected Sunsational Beach Vacations to handle all of the travel arrangements for guests attending their special event! We have secured an exclusive Group Discount Tracking Code. 3. We'll get back with you the same day in most cases! ​This is the ideal setting for our wedding and a special gathering of our family and closest friends. 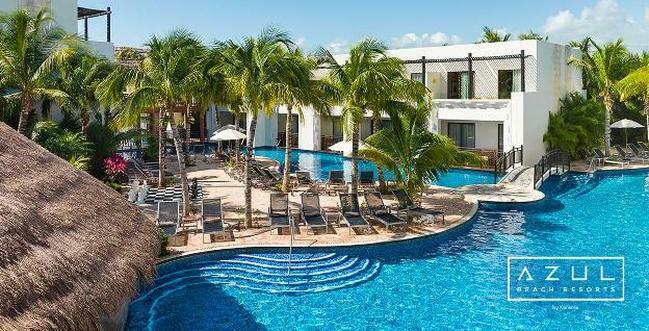 We selected this stunning all-inclusive beachfront resort on the beach in beautiful Riviera Maya, Mexico! Our guests will appreciate the oversized Resort Residences with separate living and sleeping areas, rich mahogany-hued woods, marble finishes and luxuries such as plush robes, rainfall showers, spa robes, private balconies and complete baby amenities. ​and pillow menus to personal concierges and 24-hour room service. The One Bedroom Resort Residence room features a separate living room, double-size pull-out sofa bed, modern kitchen complete with full size refrigerator, microwave, oven and stove, and dining table. The private master bedroom is furnished with a king-size bed, his & hers sinks, a walk-in rainfall shower, premium bath amenities such as a hair dryer, deluxe bathrobes and a magnifying vanity mirror. Upgraded Room Categories: The resort offers a wide range of upgraded room types including Two and Three Bedroom, Swim-up, and Penthouse Level accommodations. **IMPORTANT NOTE: We will quote/price your trip individually based on your needs and the current room rates at the time of booking. Inventory availability is not guaranteed so please reserve your room early. Note: Quoted prices with airfare are not guaranteed and are subject to change until booked and deposited. Air tickets are generally non-refundable and non-changeable once booked and issued. Group Cancellation Coverage Plan is Available and We Recommend to Protect Your Purchase. Ask Us About Prices and Coverage Options! In order to book your trip, we will need your full names as they appear on your passports and dates of birth. Also, please ensure that your passport will have at least 6 months of validity remaining at the time of travel. Absolutely! Unfortunately Not Not sure, hopefully!